I was very excited when I heard that Angelo Notaro was organizing the first HV Pizza Fest at Arbor Ridge Catering in Hopewell Junction. I was downright breathless when Angelo invited me to be one of the pizza judges! "Come hungry!" he warned me. After tasting all the pizza I could taste, I would fill out a ballot for best cheese, best specialty, and best Sicilian (1st, 2nd, 3rd prize), and best decorated booth. When I arrived around 2:45pm, the lines weren't long but the main hall was already very crowded with pizza lovers. The place smelled delicious! There was lots of excitement and garlic in the air, and all 15 vendors were very pumped to be there serving pizza, and describing each one. 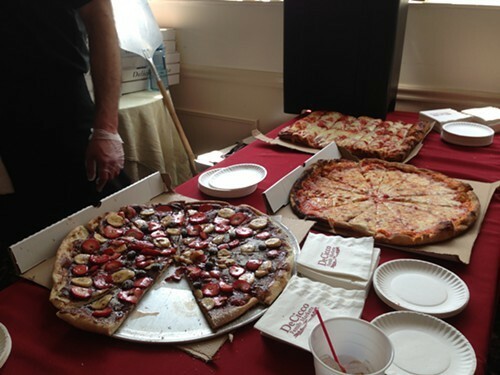 Each vendor had at least three pies—Sicilian, specialty, and cheese. As a judge, my mission was to taste all of them. It was my first time as a pizza judge, and my main regret was that I didn't take each menu home for research. It was definitely one of those times I kind of got wrapped up in the moment of eating, feasting, and trying to take photos with my iPhone using my greasy pizza fingers. It was all good fun though. I think next year, I will get there earlier, allow more time for tasting, and bring a jug of water with me so I don't have to wait on line at the bar if it gets too crowded. I will also stay longer as I missed live music from 15-year-old Annalise Azadian. I heard she wowed the crowd with her acoustic performance. I love being a media food judge! I always have this fantasy that I will actually be sitting down really civilized savoring each bite, and thinking about my decision, just like they do on those Food Network shows, but in reality at festivals it is never like that. I'm always standing up like a savage trying a zillion different types of a particular food. That's part of the fun though! As I schlepped over to the bar looking for any surface to put my heavy plate on, a young woman smiled at me as I tasted the smores pizza. "That looks good, but I don't know if I can eat that!" she laughed. Well, it was my job to taste it at least, and it was very good! It would have been great with a cup of coffee. With all the great pizzas though, I think the one that really stood out was Danny's Sicilian pizza from Danny's Pizzeria in Stormville. (They came in 2nd for best Sicilian.) It was simple, but just one of the best Sicilian slices I've ever had. It was the one pizza I could have had a second slice of! Congratulations to Angelo Natoro on a successful first Hudson Valley Pizza Fest, and to the winners of the pizza contests. The winners are listed on the HV Pizza Fest Facebook Page. My next judging gig will be at the Gardiner Cupcake Festival on May 18th for the Amateur Cupcake Contest. 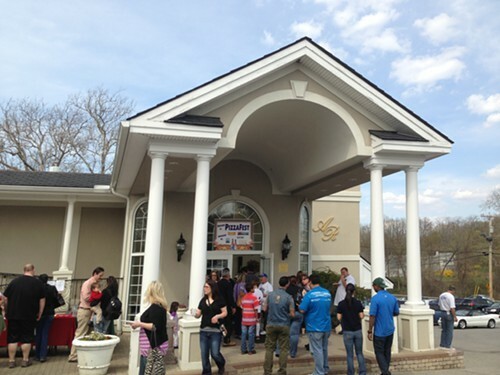 I'm looking forward to the 2nd Annual HV Pizza Fest in 2014! Follow more of Vanessa Ahern's adventures in the Hudson Valley at Hudson Valley Good Stuff.